#4570 at North Freedom, June 2001. At the turn of the century, most freight cars were still of wooden construction. The railroads were seeking ways to increase their durability under the severe conditions of day-to-day freight service. 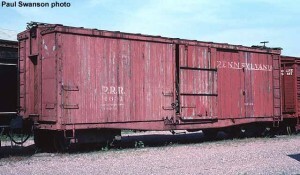 The backbone of a railroad car is its “center sill,” a large beam made of wood or steel, running the length of the car, and carrying the bulk of the car’s weight. It must withstand the pulling tension of an entire train. Design engineers looked at ways to strengthen the center sills and underframes of freight cars. One such exercise was a pressed steel “fishbelly” underframe applied to a wooden car body. 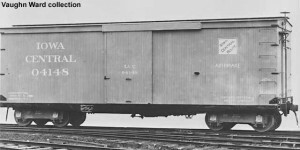 In 1901, the Pressed Steel Car Co. built a series of 300 36′ 40-ton pressed steel underframe boxcars for the Iowa Central Railway. The trade press of the day heralded Pressed Steel’s design as “an important development of the use of steel in car construction.” The cars had a very unique appearance with a steel “fishbelly” side frame that looked more like a modern flatcar. The trucks were also unique, made to the “Fox patent.” They were of all-steel construction and were stronger and more economical to maintain than the traditional designs of the era. Their simple design was proven by the number of major components comprising the truck–typical “arch bar” trucks were made of 24 parts, whereas the Fox truck had four. 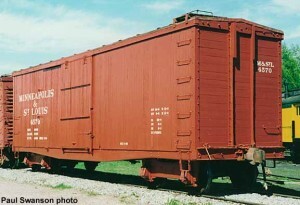 Iowa Central boxcar #04492 was one of the 300-car Pressed Steel order from 1901. It served its original owner for only eleven years. 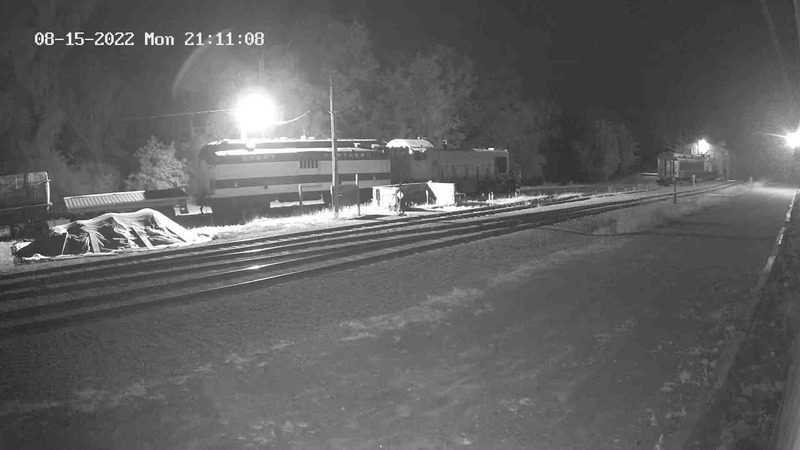 The short time period was not due to the car’s short life, but the demise of the Iowa Central itself, as it was merged into the Minneapolis & St. Louis Railway in 1912. In 1913, the car was renumbered to M&StL #4492. It was renumbered again to #4570 before 1937. In that year the car was converted to an office and tool car and renumbered #X709. Several windows were cut into the carbody, and doors added to the ends of the car. 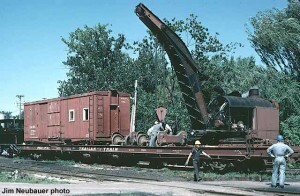 By 1976, the car was miraculously still in use by M&StL successor C&NW at Mason City, Iowa. In that year, C&NW retired #X709. Mid-Continent purchased and moved the car to North Freedom on a flatcar. Over the course of 75 years, several changes had been made to #04492: car ends were strengthened with steel angle irons, a sheet metal roof was added, new side sliding doors installed, and modern vertical ladders and safety appliances were added, but the car still retained its original “K” type air brake system and Fox trucks. In February of 1984, the car’s siding was replaced to eliminate the toolcar-era side windows and it was relettered for the Pennsylvania Railroad for use in the movie “Mrs. Soffel.” The car remained on display in its movie “garb” until 1995 when Mid-Continent volunteers cosmetically restored it to mid-1930’s era lettering and number to reflect #4570’s later freight service life and present state of modernization. To backdate it further would require “undoing” the modifications made over the years. Today, #4570 is on display and occasionally used in the freight train during special events. On the Hook and Eye. By 1900, the Iowa Central was destined to become part of the Minneapolis & St. Louis Railway. M&StL’s president Edwin Hawley had an interest in the Iowa Central and gained control when he became IaC’s own president in 1900. Thereafter, IaC was controlled by M&StL until outright merger on January 1, 1912. On that day, the “Hook and Eye” ceased to exist.